Secretary of State’s (SOS) decision to accept the 216 sheets of I-1000 petition that covered up by stickers set a very bad precedent for future initiatives. We asked Assistant Secretary of State, Mark Neary, if SOS could prove that the more than 4,000 signatures were collected AFTER the stickers were glued on. He said NO. In other words, SOS has officially put a stamp of approval on the bait and switch initiative signature gathering practice, and rocked the foundations of our initiative process. Who will ever trust our initiative process in the future? We tweeted “There are 3 versions of I-1000 petition sheets at SOS! … And they use stickers to cover the front. In other words, what people saw and signed are different from what SOS saw. Do you think this is acceptable?” And one I-1000 supporter responded to our tweets : “Do you have proof of this? Otherwise you are accusing the SOS and I 1000 campaign of fraud, without evidence. …” — Of course, we have evidence! We went to SOS election office on January 31st, and observed the I-1000 petition validation process. Unfortunately, we were not able to physically exam those sticker covered I-1000 petition sheets. Scanned images on computer screens are not able to differentiate sticker covered petition sheets from the regular ones. We were told that election office would take the 216 sticker covered petition sheets out from archive and scan them the next few days. And we would be allowed to observe and see those sticker covered petition sheets at that time. However, Assistant Secretary of State, Mark Neary, only allows us to see the actual sticker covered I-1000 petition sheets till AFTER I-1000 certification process is completed. He first rejected our request to physically exam those sticker covered petition sheets. When he learned that we could observe those sticker covered petition sheets while election office scanning them, he told them to cancel the planned scanning!!! Why is Mark Neary so afraid of us seeing the actual sticker covered petition sheets now? RCW 29A.72.170 provides SOS enough reason to reject those 216 sticker covered I-1000 petition sheets. However, SOS has no interest of rejecting them. Is it indeed a big deal that SOS accepts them? Read on and you be the judge. According to PDC report, I-1000 sponsors were billed for petition design twice. They were first billed on August 15th. The version we captured from their site on August 31st contains ballot title, summary, and text that are completely different from those of I-1000 . They were billed the second time on November 9th. And the version we captured from their site on November 11th contains I-1000 ballot title, summary, and text. Between August 15th, and November 9th, they encountered $5,239 signature collection cost. At their published $1 per signature rate, that worked out to be 5,239 signatures. At maximum 20 signatures per sheet, signatures on the 277 (61 w/o sticker +216 w/sticker) problematic petition sheets could all be signed before November 9th! I-1000 petitioners’ excuse of trying to save money just can’t fly. First of all, according to PDC report, a 300 petition sheet order on August 31, 2018 only cost them $255. Which is more cost effective? To reprint 300 copies of petition with I-1000 ballot title and summary or to manually glue on 300 stickers with I-1000 ballot title and summary? Secondly, they are willing to spend over $1 million on signature collection, $255 is nothing in comparison. However, if they had already collected signatures with those petition sheets, then glued on I-1000 ballot title and summary with stickers AFTERWARDS makes perfect sense. But, this would be bait and switch! There are more issues with the 216 sheets of I-1000 petition. According to the tips we received, backs of those problematic I-1000 petition sheets have text of Initiative 1644 – yes, a completely different initiative! Citing recent court decision on I-1639, SOS said they could not reject those petition sheets based on language differences. 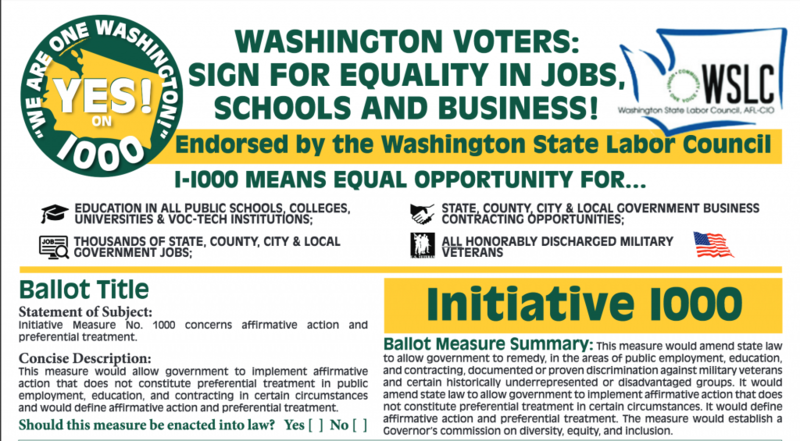 However, I-1639 petition has the I-1639 text on the back. 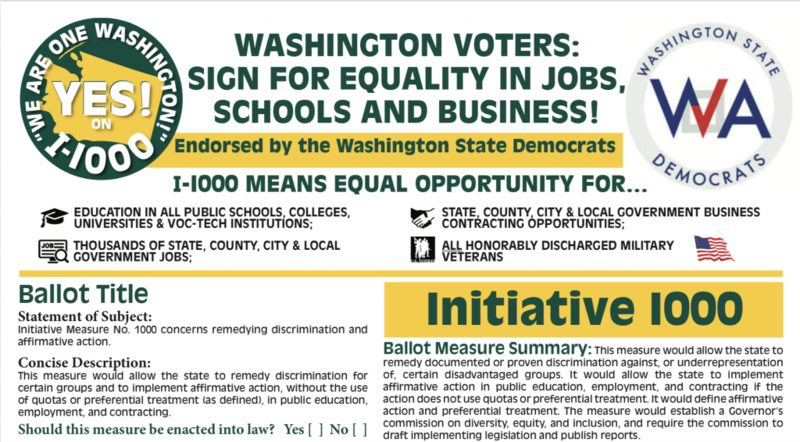 while those problematic I-1000 petition sheets have text of a completely different initiative on the back! You can compare I-1644 text to I-1000 text on SOS site. The only right thing for SOS to do is to reject those sticker covered petition sheets and protect the integrity of our Initiative Process!If you support our effort, please contact SOS, and demand public scrutiny of ALL I-1000 petition sheets. And definitely demand SOS to reject those sticker patched I-1000 petition sheets. Please call or email Assistant Secretary of State Mark Neary at (360) 902-4186 or mark.neary@sos.wa.gov.